In the third week of August, hurricane Dean battered America's mid-western and southern states, and raced through the Gulf of Mexico. Weathermen did not expect the hurricane to intensify sharply. Dean was the third most intense Atlantic hurricane to make landfall since record keeping began in the 1850s. A week before, tropical storm Erin had ravaged the region. Following these powerful tropical depressions, nasa has released animations that reveal the growth of hurricane Dean into an enormous, devastating storm and the birth of Erin in the Gulf of Mexico. According to nasa, the depressions were caused by a rise in sea surface temperatures in the central Atlantic. By late June, sea surface temperature in the area was above 27c; it was further warming up in the Gulf of Mexico, the Caribbean and the eastern Atlantic Ocean by the mid-August. 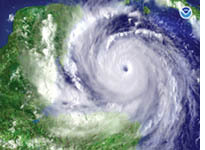 The animation highlights the formation of hurricanes, and is updated daily.